Dangerous Relationships could be a life saver. "-Susan Forward, Therapist and Author, Men Who Hate Women & The Women Who Love Them and Toxic Parents"I would highly recommend this book to anyone who may be in a violent relationship, or to a relative or close personal friend who has concerns about the safety of someone they love. "-Diane P. McGauley, Executive Director, The Family Place, Chair, Texas Council on Family ViolencePossessiveness, insensitivity, and a sudden personality change are all warning signs of a potential abuser. Dangerous Relationships will help readers recognize a potentially violent personality before it's too late. 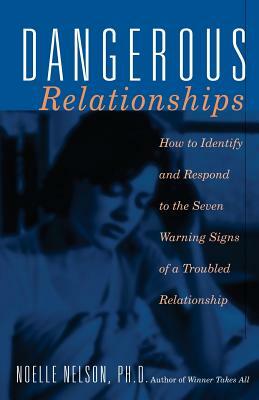 Interweaving real-life stories of four couples, Dr. Noelle Nelson highlights dangerous turning points in relationships and explains how readers can safely diffuse tension between their spouses, lovers, or roommate and protect themselves from abuse. Noelle Nelson, Ph.D., is a nationally respected clinical psychologist, trial consultant and author based in Malibu, California. Over the years, she has counseled hundreds of individuals caught in the pain of domestic violence and consulted in many domestic violence cases. As she counseled these victims of abuse, Dr. Nelson became increasingly convinced of the need for a preventive approach that could stop domestic violence before it had a chance to develop. She has been featured on CNN, CNBC, The Montel Williams Show, and The View.